aio from Shinhatsubai! 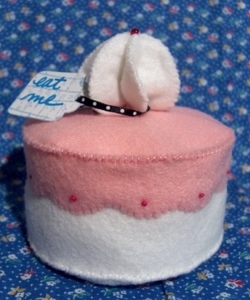 has just posted a tutorial on Craftster for her delicious felt cake (created originally, I believe, for the Alice in Wonderland Month of Softies). I've been admiring this cake ever since I saw it, and am so pleased that she decided to share her tutorial for it (Thank You!!). How fun will it be to make variations of this for the kids' "play kitchen"? Or even better....for me!! YUM!! !